The FH-1 series are a new generation of hardness testing instruments, built around a robust C-frame with exceptional stiffness and rigidity. The closed loop system is based on a precision load cell guarantees superior gauge repeatability and reproducability results than most other Rockwell hardness testers. The testers comply to, or exceed, the ISO and ASTM standards (ASTM E18, ASTM B254, ISO 6508, JIS Z2245). • FH-1-1 and FH-1-2 are supplied with a separate Brinell measuring microscope (with LED ringlight), which offers Brinell optical testing up to 250 kgf with diameter touch in and hardness values instantly displayed on the indicator. • FH-1-3 models have an attached electronic microscope and work piece sliding table. This combination allows full scale testing, as it adds not only Brinell, but also Vickers scales to the field of application. 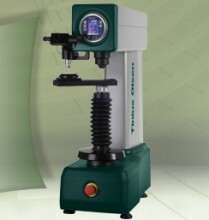 For convenience, all FH-1 models can be equipped with a motorized spindle that lifts your work piece to the required testing or measuring position, making them ideal for workshops and for educational purposes, and for those who need a combination of versatility and a degree of automation. cialis generic 60 mg b.uy.c.ia.liso.nl.ine. Klik tombol di bawah untuk menambahkan Rockwell and Universal Hardness Testers FH1 Series ke Daftar Keinginan Anda.